Mouse anti Human Acetylcholine Receptor beta antibody, clone B3 exhibits homogenous, high avidity binding to the beta subunit of nicotinc AChR, an integral membrane and cholinergic receptor, consisting of four further subunits: alpha, delta, gamma (immature muscle) and epsilon (mature muscle). The binding of the neurotransmitter acetylcholine to AChR, results in conformational change affecting all subunits, and initiates the opening of an ion-conducting channel across the plasma membrane of certain neurons, and neuromuscular junctions. 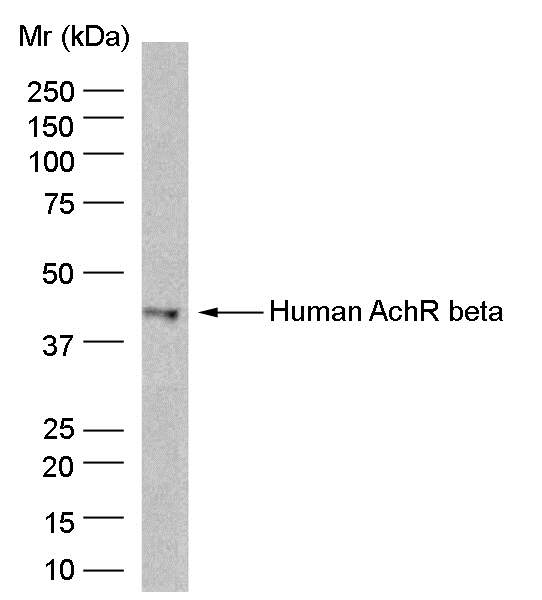 Mouse anti Human Acetylcholine Receptor beta antibody, clone B3 has been shown to bind to recombinant AChR beta in Western blotting . Whiting, P.J. et al. (1986) Monoclonal antibodies that distinguish between normal and denervated human acetylcholine receptor. J Neuroimmunol. 11 (3): 223-35. Roberts, A. et al. (1992) Search for cross reactive idiotypes on monoclonal and myasthenia gravis acetylcholine receptor antibodies. Heidenreich F. et al. (1988) Differences in fine specificity of anti-acetylcholine receptor antibodies between subgroups of spontaneous myasthenia gravis of recent onset and of penicillamine induced myasthenia. Whiting, P.J. et al. (1986) Myasthenia gravis: monoclonal antihuman acetylcholine receptor antibodies used to analyze antibody specificities and responses to treatment. Schluep, M. et al. (1987) Acetylcholine receptors in human thymic myoid cells in situ: an immunohistological study. Ann Neurol. 22 (2): 212-22.